Looking for a window bird feeder so you can watch hummingbirds frolic from the comfort of your home? How about a stylish red barn bird house to keep your backyard popular among cardinals, bluebirds or other feathered friends? 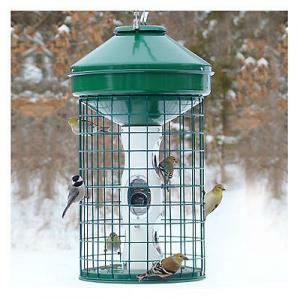 Backyard Chirper has the largest selection of bird house and bird feeder products on the Internet, all offered at affordable prices and covered with a 30-day money-back guarantee. 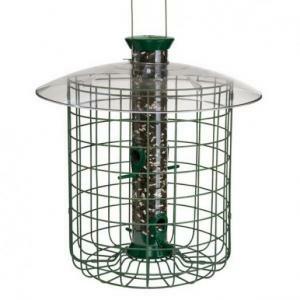 We're committed to finding you the bird feeder or house that fits your needs. Besides having a great selection of bird feeder and bird house products, we're a small business with 10 customer service employees, all with expert knowledge of our extensive bird feeder collection. Our desire to ensure customer satisfaction is the reason we offer a 30-day money-back guarantee on all our products. 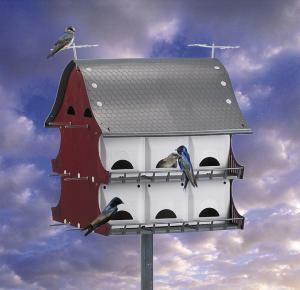 Not sure if you want a window feeder, a hopper feeder or a platform feeder? 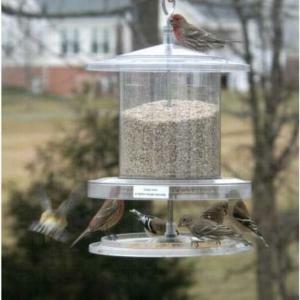 Our learning section will help you understand the difference between different bird feeder models, as will our friendly customer service staff. Want to hear what our customers say about us? Check out the testimonial below and the many other positive reviews we have on our comment page. 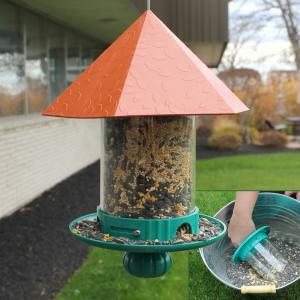 I liked the feeder because it held a good quantity of seeds and it had four divided areas to offer different kinds of seeds. The top, however, did not sit securely and could be moved. While it did deter squirrels from getting to the seeds, a large raccoon was able to knock it off the tree and break the plastic. The feeder lasted a few weeks and is now broken beyond repair. It was an expensive feeder and I'm now out the cost of it and the feeder. I have now purchased, assembled and installed eight bluebird boxes in an attempt to develop a bluebird trail in my town. 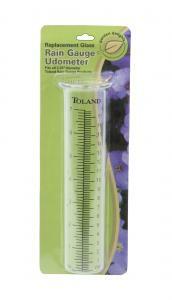 I find it a great product with good materials and easy construction. the original raingauge glass cracked because we left it outside not emptied in temps.. Service for the replacement was very good. we have kept the new glass inside and will place it back outside when the weather here warms up in March. Though bird feeding has been a popular hobby since ancient time, the first person who recorded feeding birds was a sixth-century monk named Saint Serf of Fife, who tamed a young robin by giving it food. Around the same time, a German named Baron von Berlepsch built boxes with feeding devices to attract birds, with the goal of reducing insect populations. Today, over 55 million Americans engage in some sort of bird feeding; many have a bird feeder in their yard. Once birds know that your yard is a place of solace, they'll likely return every year in growing numbers. Their presence is not something only you'll value, but your friends and loved ones as well. Why buy a bird house, bird feeder or bird bath? 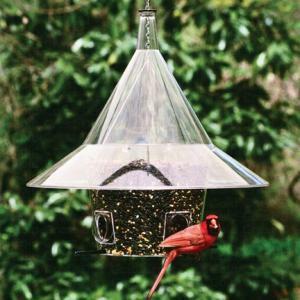 For nature enthusiasts--especially bird-lovers--a bird feeder is an exciting way to liven up a backyard garden or patio. Whether it's meditating on the soothing songs of cardinals or watching a golden-breasted oriole swoop into your yard, a bird feeder provides an added dose of natural excitement. Buying a bird feeder or bird house is also a caring way to aid some of nature's most majestic, yet vulnerable creatures. Winters mean cold weather and food scarcity for many bird species, so by providing shelter and sustenance, you'll be helping out birds in need. A bird house is a gift anyone can enjoy! 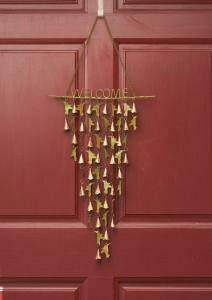 No matter if it's Father's Day, Mother's Day, a birthday or a graduation, a bird feeder or bird house is a fabulous gift. With our top-notch customer-service and 30-day money-back guarantee, you've got nothing to lose, so pick out the perfect bird feeder for someone special today! Guide to Birdbaths - A birdbath is the best way to attract the widest array of species to your yard. Here's everything you need to know about the decorative water sources for birds. How To Clean A Birdbath - Make your birdbath clean and tidy. Birds have standards, too! Winter Bird Feeding Guide - With frigid temperatures and harsh storms, it's extremely important to provide birds with a friendly environment in your yard throughout winter. How to Keep Insects Away from Hummingbird Feeders - Want to enjoy hummingbirds without being swarmed by bugs? Here are some ways to keep insects away from your hummingbird feeders.